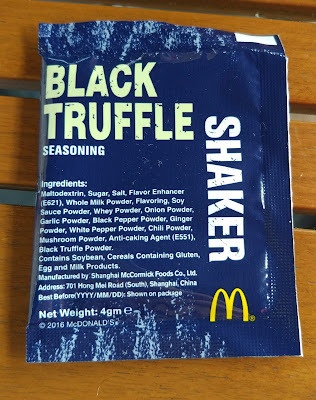 Third up in my series of four short McShakers reviews are the Black Truffle Shakers also from Hong Kong. Like it's Yuzu Pepper cousin, this was also sourced by my friend Andrew and I picked it up on my latest trip to HK (the same trip that I was able to try the Crayfish Soup and Bagel Breakfast & Purple Soy Milk). 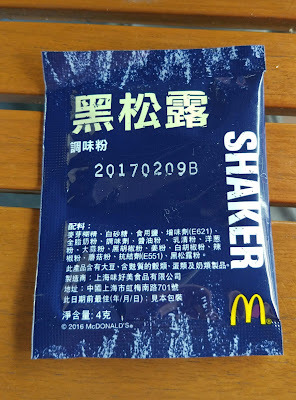 As unbelievable as McDonald's-Truffle-anything sounds, it actually wasn't the first time I've had a Truffle Shaker, as Singapore had it in late 2015. 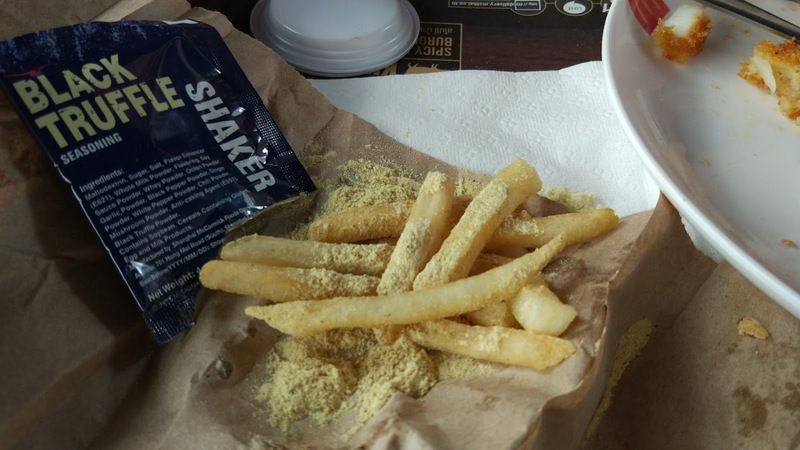 Despite my constantly repeated hatred of Mushrooms, the aforementioned Truffle Shakers from Singapore actually ended up being pretty OK in my books, but that might have been because it was only truffle "flavoured" and didn't contain any real truffle inside. 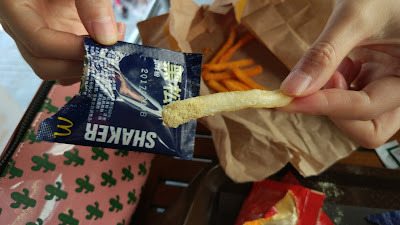 This Hong Kong edition had real black truffle on the bottom of it's ingredient list, so even if it only had a minuscule token amount of truffle inside, at least it had something. The flavour itself was definitely one of the "lightest" and most subtle shakers flavours I've tried thus far. 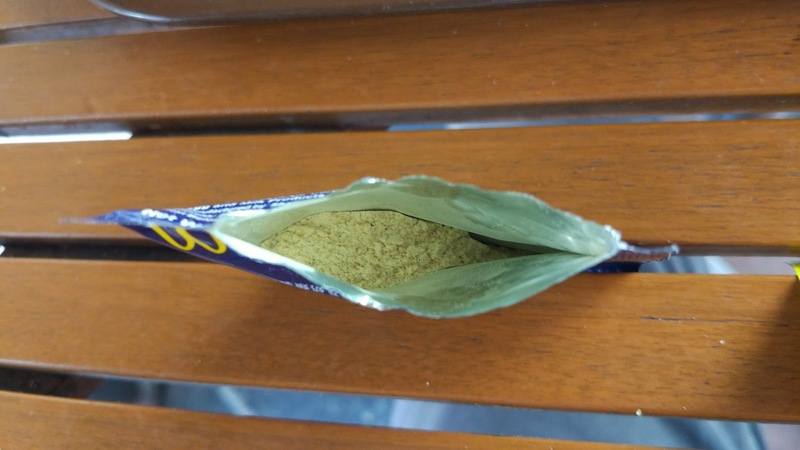 I don't think that's due to being Truffle flavoured per se, but rather due to the sheer number of other ingredients that they needed to mix with the token amount of truffle included. Some of the noticeable ingredients were Milk Powder, Onion, Garlic, Black Pepper, Ginger, White pepper, Chilli and Mushroom powder with the peppers being the standout flavours here. 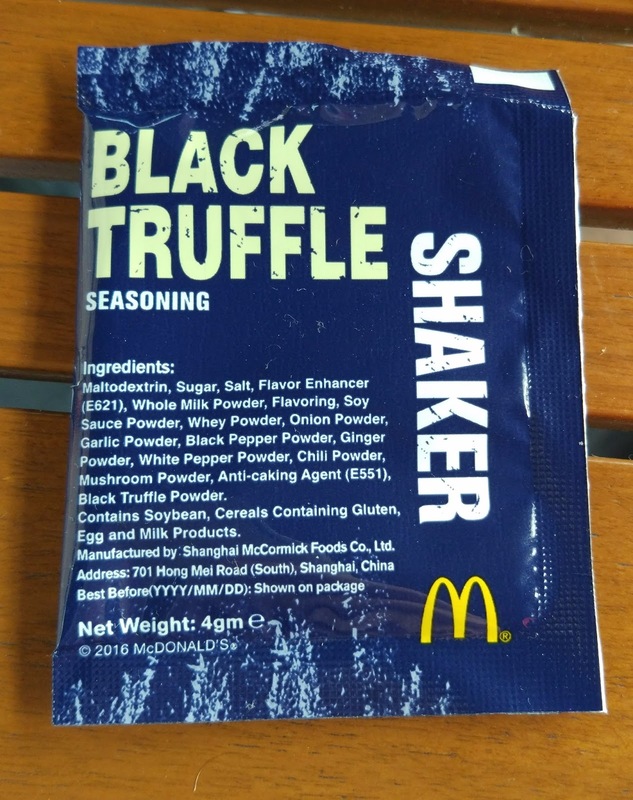 To be completely honest, if it wasn't called the Black Truffle Shaker, there wasn't really any flavour that I would have called truffle-like if I was going on taste alone. The seasoning itself had absolutely nothing wrong with it, and it probably more like a seasoning that you could buy to use outside of shaking on some McDonald's Fries. I don't think it was overly impressive on the fries so all things considered, it probably will earn a slightly lower than average score.